The ultimate guide to Hochgurgl ski holidays in 2019 & 2020. Austria’s highest and one of Europe’s most snow sure, this resort is a prime choice for a week of terrific snow. Jaw dropping scenery, a handful of high end accommodation and an unhurried pace of life make Hochgurgl one of our top recommendations for an all-round quality week on the snow. 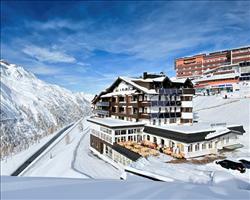 This small, stylish hamlet sits just above Obergurgl, high in the Oztal region of the Austrian Alps. Although little in size, the resort has big claims as one of Europe’s most snow sure ski areas – it’s the nation’s highest resort at 2150m and the mighty Wurmkogl peak at 3082m offers some of Austria’s best skiing conditions throughout the long season. As well as fantastic snow, it boasts stunning views of the surrounding mountains for an all-round charming alpine experience. A handful of premium hotels make up the accommodation so you can relax in a touch of luxury. Nearly everything is ski in / ski out, making days on the slopes a breeze. The laid-back atmosphere and stunning scenery make it a favourite destination for a romantic getaway to the mountain. Families are well looked after too in a quiet, traffic-free environment with ski schools, activities and events for all ages. The après scene is relaxed and based around the mountain bars and accommodation. One of the main attractions is the spectacular Top Mountain Star restaurant – this glass-fronted beacon sits on the 3082m Wurmkogl peak to give visitors spectacular vistas of the surrounding mountains. Paired with neighbouring resort Obergurgl (they’re often referred to as the same resort), Hochgurgl is known as ‘The Diamond in the Alps’. The lift pass gives you access to their shared ski area which includes 110km of perfectly groomed piste, connected by an excellent lift system which keeps queues at a minimum. First-timers can save money by purchasing a special pass at a reduced price before they gain the confidence to explore the rest of the mountain. Keep an eye out for discounts for young and senior skiers too - remember to bring ID to the ticket office to qualify. View our detailed Hochgurgl snow forecast or snow report and see all live webcams, piste maps, road and travel maps and lift pass prices. For a picture of historic snow conditions see the snow depths month by month with our Hochgurgl snow history. The ski area sits high in the Oztal region of the Austrian Alps and is famous for being snow-sure throughout the season. With the resort at a high 2150m, skiing back to base is pretty much guaranteed and with a peak that reaches 3082m you’ll ski some of Austria’s best conditions. The Topexpress gondola connects this ski area to neighbouring Obergurgl giving skiers and boarders 110km of varied piste to explore. The main ski area above the resort is well suited to progressive beginners and intermediate skiers – there are heaps of blues to cruise and wide open runs for practising those turns. Hochgurgl ski school gives lessons to all abilities and beginners can steady their skis on the nursery slope in the village. Beginners have free reign across the mountain and the steady blue 26 makes a leisurely run back down from Wurmkogl peak. For the more confident, a few red runs offer more of a challenge – red 25 (the longest run) sweeps through the trees for a long and thrilling 8km descent whilst red 20 is a fast motorway run – perfect for speed-lovers. For red graded runs, work your way over to Obergurgl - after fuelling up at Hohe Mutt mountain bar take the narrow, windy number 1 to join the steeper 16 back to the resort. Black 27 from Wurmkogl peak is usually powdered and mogulled – a favourite thigh burner for expert skiers. Freeriders have loads to explore with some great powder by the Kirchenkar lift and the ski school leads freeride tours for experiencing more untracked snow. Boarders can roam the whole mountain without coming across too many drag lifts. There’s some wide carving terrain and a fun park fully kitted with jumps and rails at Obergurgl – take the Festkoglbahn chair lift to find this freestyling hot spot. The après scene is fairly relaxed with most of the atmosphere centred on the mountain bars and, later, the hotels. One of the main attractions is the Top Mountain Star at the peak – the glass-faced bar, restaurant and terrace offer spectacular panoramic views across the surrounding mountains – a must visit for a lunch stop or casual drink at least once during your stay (don’t forget your camera!). There are a number of cosy restaurants on the mountain, one of our favourites is Hohe Mut over at Obergurgl which has a fantastic terrace overlooking 21 snow covered peaks. If you’re eating on the mountain make sure you try the Tyrolean Grostel – a dish of pan fried potato with onions, meat and salad. After a long day on the slopes, lots of skiers head back to Arnos Umbrella bar at the Hochgurgl gondola to wind down with a glühwein. The most popular spot for après ski drinks is Toni’s Almhutte where you’re likely to find a lively atmosphere and drinks flowing. If you fancy heading out for a few sherries the African bar usually gets lively later on. The resort is known for holding weekly toboggan evenings which attract crowds from Hochgurgl and Obergurgl and are a lot of fun for everyone. After a glass of glühwein to soothe the nerves, take the plunge down the 8km run from Hochgurgl to Pill - the grill at the end of the slopes fills up with a vibrant atmosphere where you can carry on the party. Another evening must is the ‘Skivolution’ show at Obergurgl where the ski instructors test their tricks on the mountain along to music and a firework display. A shuttle bus runs through the valley making it easy if you fancy heading out for a night in Obergurgl. When is the best time to ski Hochgurgl? This is one of Europe’s most snow sure ski areas and as Austria’s highest resort at 2150m and the peak at great 3082m, you’re pretty much guaranteed amazing snow throughout the long season which usually runs from November through till May. 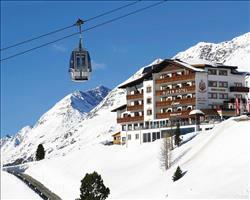 The high altitude makes Hochgurgl a good choice if you’re looking to ski later on in the season. You’ll usually enjoy long, sunny spring days when the warm sky doesn’t hamper the conditions on the piste. There’s also loads of mountain bars so if you fancy catching some rays you can perch on a sunny terrace high up the mountain for a relaxing afternoon. With weekly toboggan night at the resort and a weekly ski show held in neighbouring Obergurgl, there’s always something happening here so you’re likely to catch one of these whenever you choose to ski. As a popular resort for families it tends to be busier during the school holidays but queues are kept to a minimum thanks to the efficient lift system. 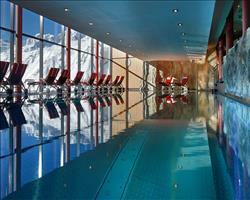 The laid-back atmosphere and quiet, traffic-free streets make Hochgurgl a family favourite. The handful of hotels that make up the village are mostly ski in / ski out with the majority really near lifts meaning an easy journey on to the piste. Hotel Riml and Sporthotel Olymp are terrific for a family holiday – for anyone taking lessons, they’re opposite the ski school meeting area and nursery slopes which makes getting to the slopes hassle free. The ski area is perfect for family time on the slopes as the mountain is filled with cruisey blues that lead from most lifts. Children skiing for the first time will be introduced to the snow with Hochgurgl Ski School on the nursery slope at the village. After conquering the ski lifts beginners can freely roam the mountain and take advantage of skiing conditions above 3000m – take everyone to the Top Mountain Star for beautiful views of the mountain (a great place for a family photo) before skiing down the Blue 26. See if the ticket office are still offering discounts for beginners, children and teens – you might save some money! With a number of events put on throughout the week, all ages will enjoy their evening here – a weekly toboggan evening is held on the 8km toboggan run and neighbouring Obergurgl is known to hold its ‘Skivolution’ event every week – a magical night of ski shows, music and fireworks that everyone will enjoy. Make meal times easy on a half-board holiday and choose the cheapest and easiest way to book by choosing a package with flights included. Opt for a self-drive package and have your channel crossings sorted or browse our independent travel section if you’re looking to book accommodation separately. Our friendly staff are on hand with expert advice – drop us a line with any questions! Groups who like the sound of unbeatable snow, alpine charm and quiet evenings with a fireside sherry will love this snow-sure resort. Our top-class accommodation is in prime location for the slopes and you can choose to be in the centre of the action at one of our large hotels. Sporthotel Olymp is in the heart of the resort and is next to the popular après bar, Toni’s Almhutte, where you’ll find the liveliest nightlife. Angerer Alm offers a top quality stay - its central ski in / ski out location is ideal and its traditional décor is rich in stylish alpine charm. Choose from a variety of board options with your hotel accommodation – make meal times easy with a half-board holiday or free up your evenings with B&B. Groups should venture up to Wurmkogl peak for lunch or drinks at the Top Mountain Star – with a restaurant, bar and terrace overlooking stunning views it makes a unique and memorable time on the mountain. From here you can ski down Blue 26 or Black 27 to meet the other runs leading back to base. You’ll find a lively après scene in the mountain bars – when the day is done, the ski’s come off at Arnos Umbrella bar and there’s a vibrant atmosphere at Toni’s. A weekly toboggan evening held at the resort is a great night for everyone – after a sip of glühwein to soothe the nerves descend the 8km run down to Pill where the grill at the bottom of the piste carries on the party. Nearby Obergurgl’s ‘Skivolution’ is another must visit event where ski instructors showcase their tricks along to music and fireworks. Group bookings are made easy in our package holidays with flights and transfers included. You can also choose a self-drive package with channel crossings or if you want to book accommodation separately browse our independent travel section. We have the best group discounts in the business – give our ski specialists a call for friendly advice and easy booking. We had an absolutely great week in all respects, apart from the weather… it snowed the entire week and one day nearly all of the lifts were shut. The good thing about this resort (apart from it being snow sure!) is that there’s a vast expanse of runs. Grown-ups who have been to the French Alps and skied types of areas like the Trois Vallees would probably be bored, but it’s great for families: There’s no queuing for lifts and I like that the kids get up on the mountain, instead of being stuck in ski school at the bottom. The restaurants on the mountain are really good. There are local buses that take you down to Obergurgl (every 10 minutes) if you want shops and restaurants, although the shopping isn’t all that. Access from the airport is very easy, we had a private transfer which took about an hour and a half. Couples or groups wanting somewhere with a buzz after dinner probably wouldn’t like it here, but for families it’s great.